Damn, I really want to check this place out. I have to be in Nashville June 4 - 7 for sales training. The location in Brentwood where we will be doing the training is a really congested office park setting and I won't have anyplace to park my chit. 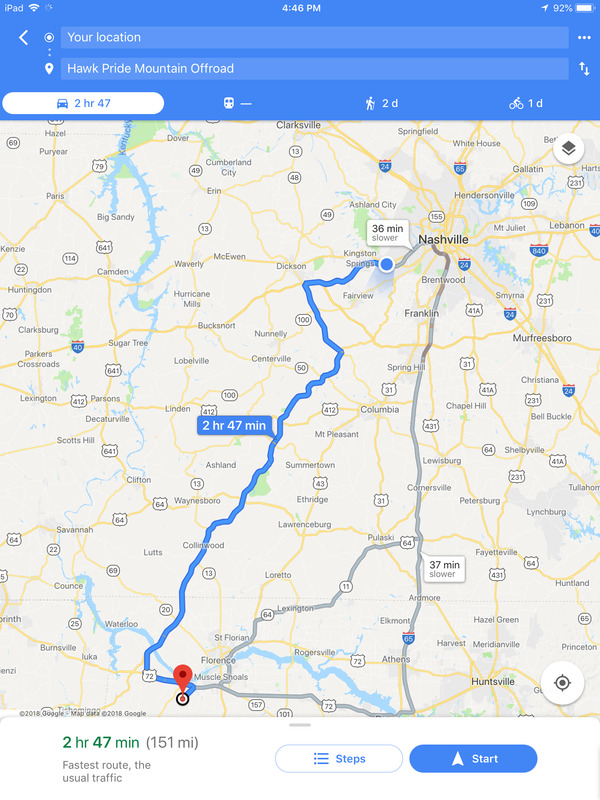 Hmmm...if I can find a secure place to park my truck and trailer for the week maybe I drive my crap to Nashville on Monday and then haul to Hawk Pride on Fri morning... Research underway. Need to check with my local colleagues to see options. let me know and I’ll be glad to ask him & put you in touch. That’s very kind of you, thanks for the offer. I don’t like putting anyone out and I think I have a plan with the CubeSmart I found. Dammit! I had planned on this trip, took Friday off, but I have done scheduling conflicts at the moment. My son decided he wanted to spend the summer with me and is flying in on the 9th. Flight is easy to change but I have other conflicts as well. I’m planning to leave Alpharetta that Friday around noon. Hopefully earlier, and hopefully hit some trails Friday afternoon before settling in. Looks like a great park. Been to this park 3 times and it is at the top of my favorites. Definitely download the Avenza Maps app and get the CartoTracks to help you get around. Anyone going by allsouth prior to this trip? And have room for something slightly larger than a shoebox?